Canada’s marijuana task force announced Wednesday that it has fulfilled its mission and soon will deliver a final report to the government outlining recommendations for the country’s legal cannabis framework. The Food and Drug Administration has given approval to Phase 3 clinical trials of MDMA (ecstasy) for the treatment of post traumatic stress disorder (PTSD). This is the final step before the potential approval of ecstasy as a prescription drug. The move comes after several successful Phase 2 studies of ecstasy, which included 130 PTSD patients. These were conducted by the Multidisciplinary Association for Psychedelic Studies (MAPS). The new research will include at least 230 participants and will also be conducted by MAPS. The trials already conducted focused on treating those with PTSD who had not responded to traditional prescription drugs or psychotherapy. In one of the studies, after three doses of MDMA administered under a psychiatrist’s guidance, patients reported a 56% decrease in symptom severity. By the end of the study, two-thirds no longer met the criteria for having PTSD. The post F.D.A. 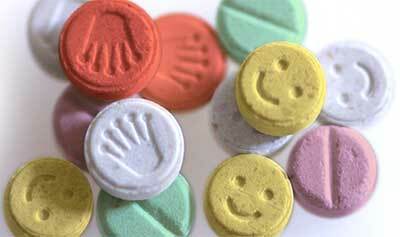 Approves New Phase 3 Studies for Ecstasy as PTSD Treatment appeared first on TheJointBlog. The Titanium Grasshopper vaporizer has grabbed attention over its powerful heating element and discreet, pen-like design. Does it live up to the hype? Medical marijuana isn’t just beneficial to humans; dogs can benefit greatly from the medicine. But many aren’t sure how to go about obtaining or administering it. When it comes to medical marijuana for dogs, the most common form of administration is through tinctures. Tinctures are a liquefied version of cannabis or hemp, often mixed with glycerin. Tinctures are typically dropped onto the tongue, or onto food. Another popular method of administering medical marijuana to dogs is cannabis oil. A small, rice-sized amount is typically placed onto a piece of bread or dog biscuit. Either method is a viable option. The first challenge to treating your dog with medical marijuana is obtaining it. Online it is easy to find pet medicines that contain cannabidiol (CBD), one of the medical compounds found in cannabis. However, these products are derived from hemp, not cannabis. This is what makes them legal. However, hemp-derived CBD isn’t typically as effective as marijuana-derivced CBD. Still, it clearly has medical properties and is worth trying. A simple Google search for “CBD for pets” or “CBD pet products” will bring up multiple companies who sell such products. Although cannabis-derived CBD may be more effective, it isn’t legal in most areas. Qualified medical cannabis patients in states like California and Colorado where there are dispensaries should be able to easily obtain high-CBD, low-THC tinctures, though the legality of purchasing it for your dog, rather than yourself, is questionable at best (we’ll touch on this a bit more later in the article). When it comes to dosage it varies greatly by the condition and the dog. For a small dog, typically 1-3 drops of tincture, twice a day should be plenty to bring about the intended medical benefits. With larger dogs you may want to increase it to 5-8 drops. For cannabis oil, a rice-sized to a double-rice-sized amount is typically plenty. The best thing to do is start with a moderate amount, and monitor your dogs behavior. If it doesn’t seem like they’re improving much, slowly increase the dosage. If you get tincture derived from hemp, or get cannabis-derived tincture that’s low in THC, even large amounts won’t get your dog high, so over-dosing isn’t much of a concern. When it comes to medical marijuana for dogs, many have the same question; is it legal? When it comes to hemp oil or hemp-derived CBD, the answer is simple; yes. Although cultivating hemp is illegal in the U.S., the production and distribution of hemp products is very much legal; this is why you’ll find items like hemp cereal at mainstream locations like Wal-Mart and Fred Meyers. When it comes to cannabis-derived CBD, the question is a little more complicated. As mentioned-above, medical cannabis products can be obtained legally by patients in numerous states. The law surrounding giving it to your pet, however, is more unclear. Most states don’t have any law specifying the legality, or illegality of this. However, it is plausible that officers could try to persecute someone under an animal cruelty/endangerment statute. There is little to no precedent of this, but it’s certainly a possibility. Truth being though, if you’re a legal medical cannabis patient and give some to your dog, there’s no reason law enforcement would ever find out (but take this advice with a grain of salt – we’re not attorneys). However, we do highly recommend if you go this route to make sure you get low-THC, high-CBD products. The post Medical Marijuana for Dogs: What You Need to Know appeared first on TheJointBlog.